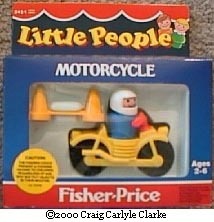 Description: This is a 3-piece Little People Motorcycle set, including a motorcycle, driver, and a pylon. While this set was being sold in the USA, the #634 Motorcycle set was being sold in Europe. The #634 uses the same motorcycle and driver that this set uses, but while the USA got a pylon with the set, Europe got a really cool motorcycle trailer with a removable lid and 2 motorcycle ramps. Sadly, these cool pieces were never sold in the USA. AVPP - Tall blue-bodied driver with a white motorcycle helmet.